Disclaimer: Most often I post stuff here about other people and events and don’t write personal stuff. This is an exception. I had to chuckle at myself this morning as I put together the granola ingredients I recently purchased at Whole Foods. Yes, Whole Foods! And I wasn’t happening past and decided to stop in. No, I drove 27 miles round trip to spend top dollar for groceries, organic groceries, no less. The chuckle represents a past of disinterest in healthy food, which means I have to admit I fed my growing family hot dogs and Kraft Mac’n’Cheese and fast food and instant this/that and an occasional well-balanced meal. While I’m not going to beat myself up for creating cookie monsters out of my children, who are now plenty old enough to make their own eating decisions—I am going to confess my enlightenment at age 64 regarding my food choices. Granola is the word we always used to describe someone who was “earthy,” someone who didn’t shave her legs and wore hippy clothes and didn’t eat meat and lived in a commune. And now it’s time for me to eat my words. It all started when a horrendous chronic cough took over my life. I couldn’t go anywhere without a supply of cough drops, tissues, and water. My coworkers were patient about listening to my fits, but it had to be disconcerting. A good night of sleep never happened. I went through so many boxes of Puffs I finally had to resort to manly “handkerchiefs,” which I kept handy at all times. 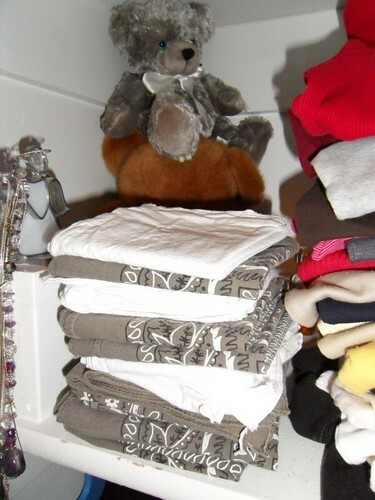 Just to give you the idea, this stack on my closet shelf got used and washed every week! I keep them there, unused now, as a reminder to stick with my new regime. My doctor put me on several batches of antibiotics, one with a “prednisone taper.” The meds didn’t do anything for my cough; however I couldn’t help but notice that the steroid took away all my pain, my near-constant companion since our bike crash nearly four years ago. Two health issues dictated my livelihood. So I went to an ear/nose/throat doctor, who looked at my sinus CT scan and scoped my nasal passages and declared them all clear. But he had one idea: silent reflux and gave me a sheet of instructions. I couldn’t even find it in a Google search but figured I didn’t have anything to lose. 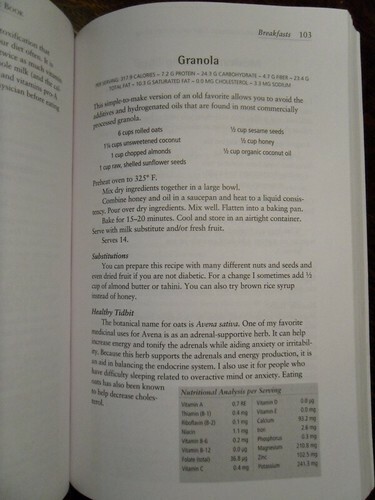 On November 30 I started two restricted diets, one to stop my cough and one to stop my pain. I don’t eat dairy (except organic butter in tiny amounts), onions, garlic, potatoes, tomatoes, citrus, peanuts, wheat (gluten), corn or corn products, caffeine, pork, shellfish, refined anything, carbonated anything, the list goes on. I’m happy to report that with the changes in my eating (along with a strong dose of over-the-counter Prilosec), my cough disappeared! Believe me, after more than a year of hacking, I am one happy camper. 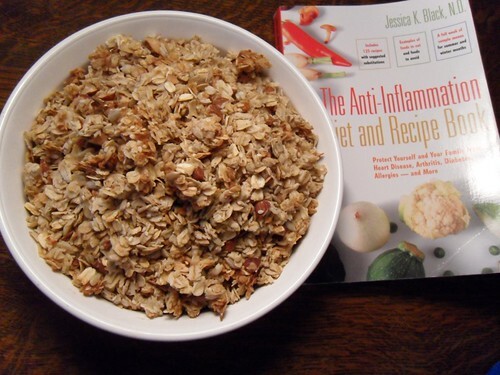 John and Erin loaned me their anti-inflammation diet book (pictured with the granola), and I’m sticking with it, come hell or high water! The pain isn’t gone, but I’m sure it’s better. Eating good food is a good idea in general. I’d like to think I’m convinced. It takes effort and regular denial, but if it improves my quality of life, I’d say that’s a reasonable tradeoff. And if it extends my life, so be it, especially if I can be like Mom Edna, who at 90 embraces with vigor the time she has left. 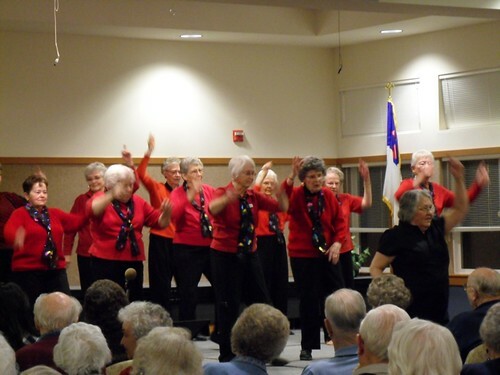 A couple of days ago I went to see her in the annual talent show at her retirement home—line dancing! There she is, front row, second from the right. That’s me in a couple of years. Just call me “Granola.” However, I plan to keep shaving my legs. It’s so good to hear (or not to hear in this case 🙂 that your cough is gone! Praying the same for that stubborn pain!